I’ve come a long way from making stitches that looked like I sewed in the dark. While I haven’t mastered sewing by hand and by machine just yet, I’ve overcome a lot of problems that seemed so major before but now are really just typical beginners’ errors. 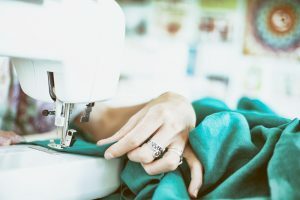 If you’re a beginner and find you’re having a difficult time operating a sewing machine, it could just mean that you’re committing some of these errors. Here’s why it’s wrong and here’s what you can do to fix it. Not all sewing machine needles are alike. In the United States, these needles range in size from number 8 to 18, while the European equivalent ranges from 60 to 110. Most needle companies show both sizes on the packaging to avoid confusion. The lower the number, the finer the needle. Lighter fabrics require smaller needles because bigger needles leave larger, unsightly holes. In the same way, thicker and heavier fabrics require bigger needles to puncture through it. Sometimes, the same also applies to the type of thread you’re using. It’s why you might find the sewing needle constantly breaking after a few uses. Using a size 9 on fabrics such as denim will definitely break or bend the needle, which affects the quality of the stitching. 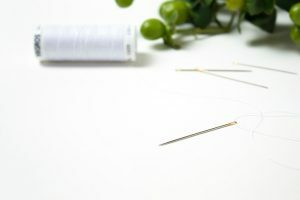 Check out this sewing resource from Singer, the company producing most of the sewing machines in the industry, and how to choose the right sewing needles based on the material and purposes needed. You’ll be surprised to find your needles breaking a lot less when you pay attention to the quality. Needles can also break or bend after prolonged use, so remember to change the needle every 16 hours of stitching time. I’m not just talking about keeping your pins, threads, and needles in the same box. Since there are various types of supplies such as needles and threads used in different kinds of projects, keeping an organized set makes it easier for you to work without having to look for the materials as you work. It’s much more efficient to work when you don’t have to dig around your sewing kit for that one thread you know you have but can’t seem to find. When you’re organizing, my advice is to keep your sewing machine supplies separate from the rest of your materials. Put the machine needles, bobbin pins, and the large rolls of thread to one side so that you aren’t disorganized when you need to use your machine. If you find that your machine isn’t working properly, or your thread tends to bunch up even though nothing is wrong, it could be because you haven’t given your machine a proper cleaning and dusting after months of use. Eventually, the lint from the fabric and thread and the dust accumulated will get in the bobbin area and mess with the tension settings, so it’s best to take your machine for professional maintenance regularly. We’ve been taught to push a fabric slowly under the presser foot, but beginners tend to want to rush their work by pulling the fabric from behind. However, this could damage the stitching because while you’re pulling the fabric from behind, you’re also tugging at the fabric that hasn’t reached the presser foot. As a result, you’re force-feeding the machine against the feed dogs, and that could result in uneven stitches. One of the skills you’ll learn through sewing is patience, especially when you’re working with a sewing machine. Take your time and let the feed dogs move the fabric along – don’t pull at it. As a beginner, your projects should start out simple before you can successfully pull off more complicated DIY projects. 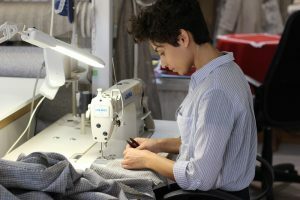 Projects like handkerchiefs, longline tops, long skirts, and even pajamas are great starter projects because they cover the basic skills you need before moving on to bigger projects. Stick to one project and don’t start on the next one until you’ve finished. Along the way, you will develop your sewing skills and learn from your mistakes, which you can avoid or improve on in your next project. From measuring your size, to making a pattern, to cutting out the pattern, you can’t just cut a generous amount of fabric and expect to just cut parts out when it’s necessary. One, it’s wasteful on fabric you can recycle for future projects. And two, not accurately following the pattern or taking the right measurements can lead to an ill-fitting result. Start by understanding how to properly measure yourself. If you buy pattern sizes for the size you usually buy for your clothes, your project could be much bigger than your actual body size. Different pattern makers use different sizes, so it’s important you take accurate body measurements of yourself every time you start a new project. There are different types of fabric, and for good reason. Some projects will require thick material, while other projects look best with soft, moveable fabric. When you buy a pattern for your latest project, you’ll find fabric suggestions listed at the back of the envelope. These are recommended, but you can choose similar types of fabric. However, I wouldn’t recommend experimenting on fabric while you’re still a beginner. Once you get the hang of sewing, then you can start experimenting with different materials and studying how to work with it. Before you begin using your sewing machine, check if the bobbin and the tension dial have the appropriate amount of tension. It’s a common mistake for beginners because it’s also difficult for experienced sewers to gauge the right tension for the thread on the material. Incorrect tension can result in uneven or tight stitches. Check the tension settings on the dials. The bobbin should be threaded into its cases correctly and in the right direction. To check if it’s the right tension, take a scrap fabric from your project and run it through the sewing machine to check if the tension is correct. Take note if it’s too tight and adjust accordingly. Lighter fabrics require little tension, while heavier fabrics need bigger tension. As you’re sewing by hand or with a machine, you need to have a flat iron ready to press your seams after sewing every side. This is not just to control the seam allowances and to firmly put them in place, but also to let the thread meld into the fabric. Left on its own, the thread doesn’t stay attached to the fabric, and it can come loose eventually. It’s a tiresome and repetitive chore after fixing the seams, but necessary if you want your seams to stay properly fixed. And beginners who think they might be pressing their seams may be ironing, not pressing. Ironing involves moving the iron back and forth; pressing is only pressing the iron on the seam with little pressure before lifting it back up. Ironing can distort the fabric’s grainline, so it’s very important that you press, not iron. As I mentioned earlier, one of the skills you’ll need to learn while sewing is patience. Some beginners think they can get away with learning how to sew by hand by having a sewing machine ready. However, there will be some patterns, fabrics, or sewing styles a sewing machine cannot perform. In these cases, you will need a steady hand and basic skill to deliver clean and uniform stitches. You don’t need to learn all the stitches, just the basic ones that are very useful and not available in all sewing machines. Some of these include the running stitch, the basting stitch, the cross-stitch or catch stitch, the whipstitch, the ladder or hidden stitch, and the back stitch. This tutorial on the six basic hand stitches can help you learn quickly. By addressing these basic issues, you can keep improving your skill and perform more complicated DIY project. 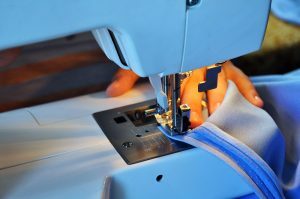 So, the next time you pick up your sewing kit and start your sewing machine, watch out for these common beginners’ mistakes and avoid committing errors that could affect the quality of your project.